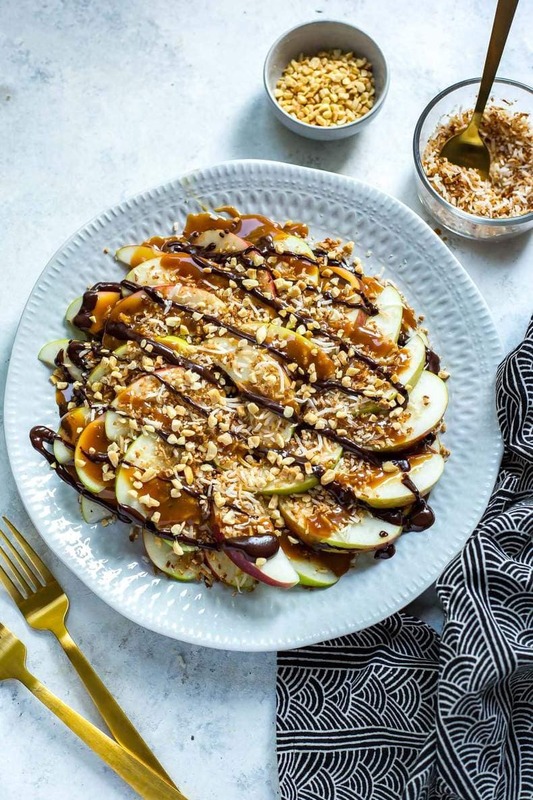 These Healthy Samoa Caramel Apple Nachos are a delicious way to enjoy fresh fall produce and a healthier way to get in a sweet little midday snack or after-dinner treat! 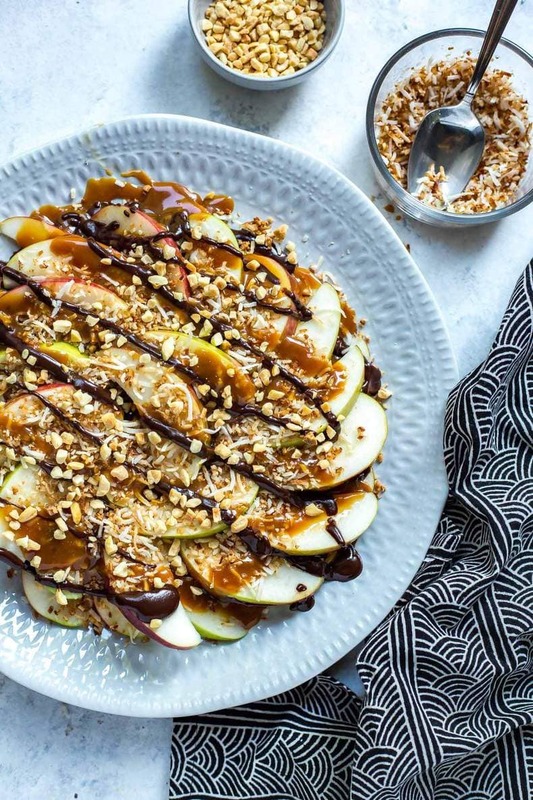 Samoa Caramel Apple Nachos that is! 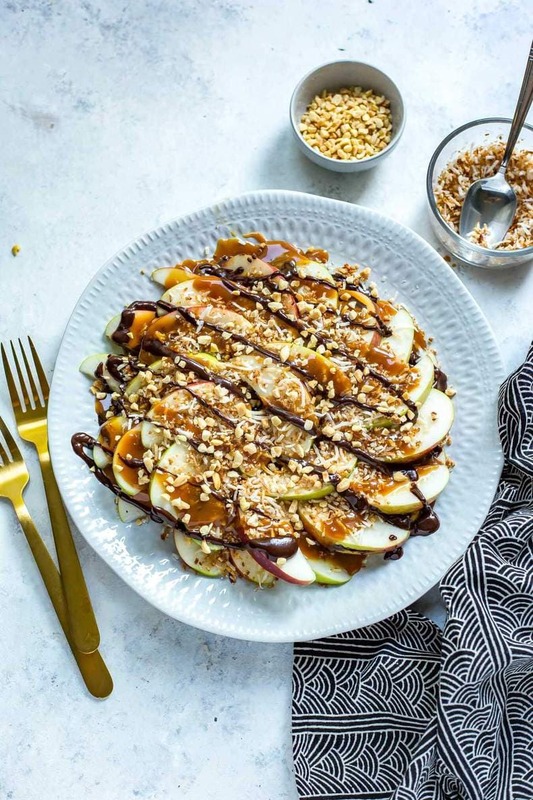 Add a touch of toasted shredded coconut, a drizzle of chocolate and a little bit of caramel (or dulce de leche if you REALLY wanna indulge) and you've got me hooked on fruit for days. And you know that that's serious, because my hatred for fruit goes way back. Too much of my mom telling me to eat a piece of fruit as a kid when I was craving something savoury I think. But with these nachos, I'm seriously in love. And I mentioned that these are fairly healthy, right? 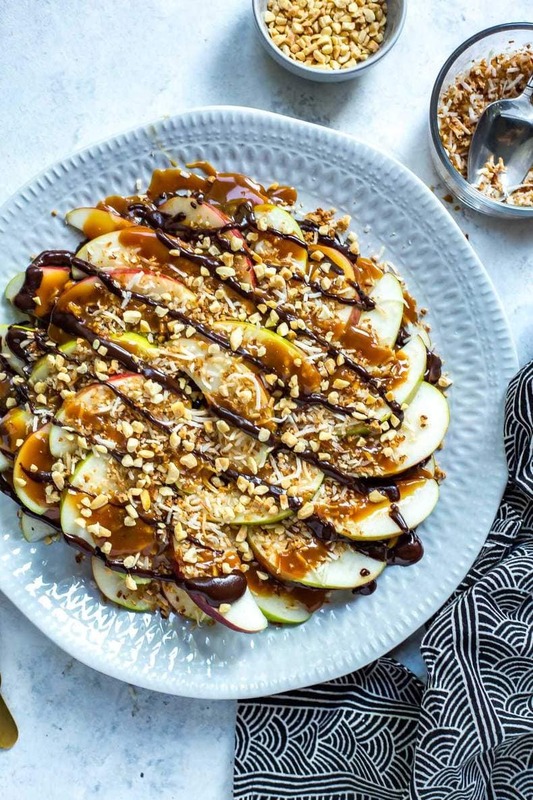 When you think about it, these Healthy Samoa Caramel Apple Nachos are basically like a mix between your fave Girl Guides cookies and a deconstructed version of caramel apples, except you get WAY more caramel and tons of super fun toppings without having to deal with the mess that a caramel apple can bring. Basically, this is the most amazing combination everrrrrrrrrr. Speaking of caramel apples, they really remind me of Halloween. And every year for the past few Halloweens I have really missed out on dressing up and truly getting in the spirit. I know everyone says their fave holiday is Christmas but honestly, I'm a Halloween kind of gal. It's not even about the candy, but more about the spookiness that comes with the end of October when the leaves start to fall and get crunchy, and then it starts to get dark out earlier and there's just this irresistible, hauntingly crisp smell in the air and I feel like I just want to live in fall forever. There are so many opportunities for cozy fall nights in, and I absolutely LOVE horror movies and dressing up so this time of the year is just one of my favourites. And the food is also pretty amazing I suppose. Like seriously, give me ALL the butternut squash and pumpkin alfredo! AND THESE SAMOA CARAMEL APPLE NACHOS. Let me say a few more words, because really these are over-the-top and extra, just like yours truly. But you're still getting your fruit, making these a healthier snack or dessert when that craving for sweets hits. I'm honestly so against depriving yourself of cravings. 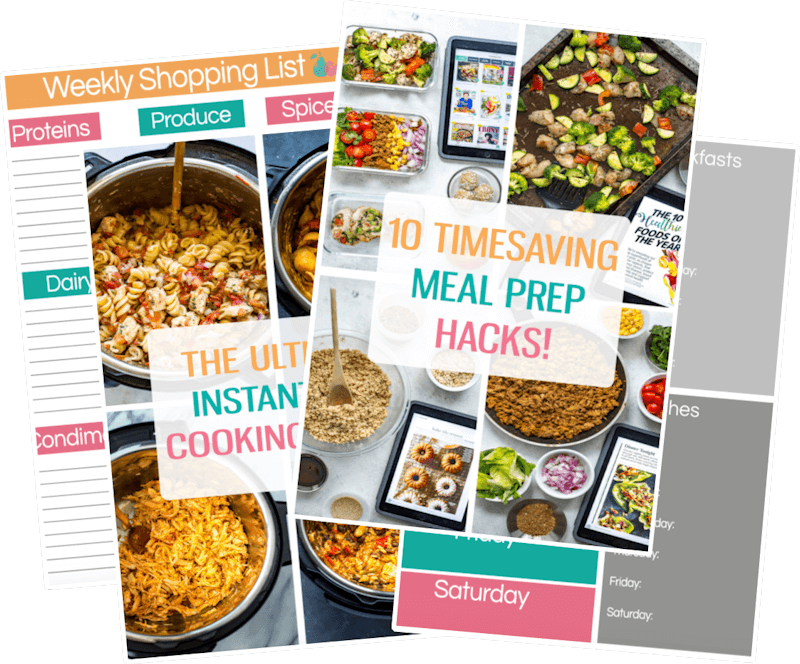 I think it just makes you that much more likely to overindulge so I'm very much the type of person that eats whatever I'm feeling, just to a smaller scale. 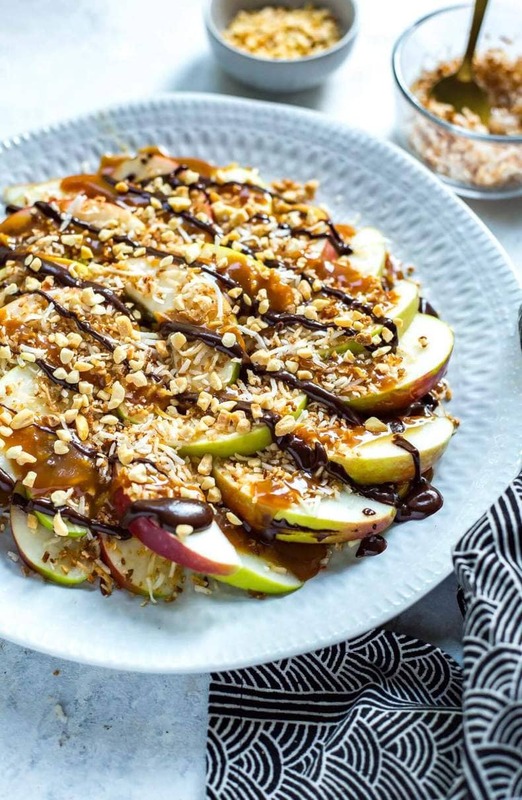 In this case, just a touch of chocolate and caramel is all you need, and the toasted coconut gives these Samoa Caramel Apple Nachos a hint of richness and an extra dose of sweetness so you won't have to go through a whole candy bar or giant caramel apple in order to satisfy your Halloween candy cravings. 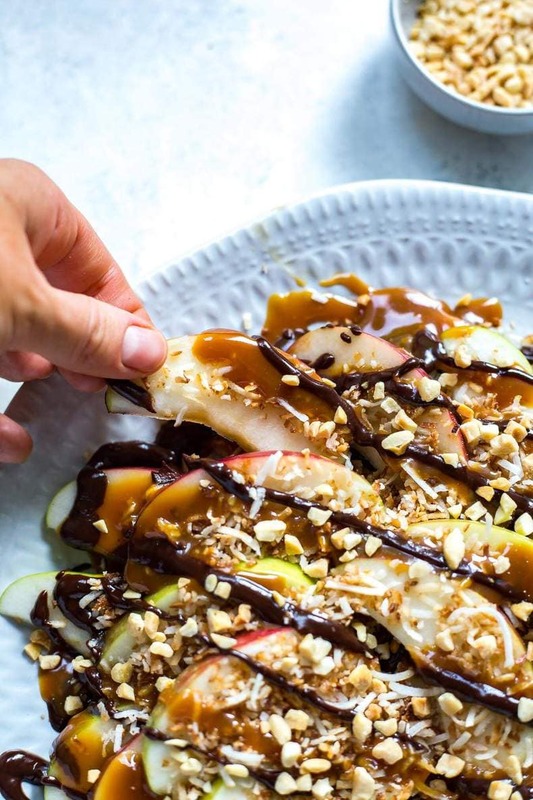 The most time consuming part of these Healthy Samoa Caramel Apple Nachos really is toasting the coconut, because other than that you are basically just cutting up the apples and layering on a bunch of your favourite sweets. I melted chocolate chips in the microwave and used store-bought dulce de leche (you can find it in the ice cream toppings isle), but you could just as easily use chocolate and caramel syrup to make things easy. 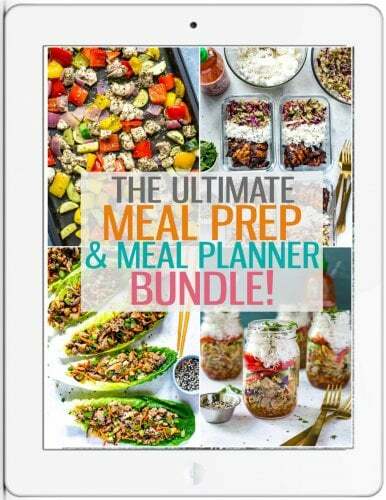 Most of them already come in a squeeze bottle to make your life even easier, so go that route if you're feelin' it. Finish off with some chopped peanuts and any other nuts of your choice, and you've got delicious apple nachos for days. You're welcome! 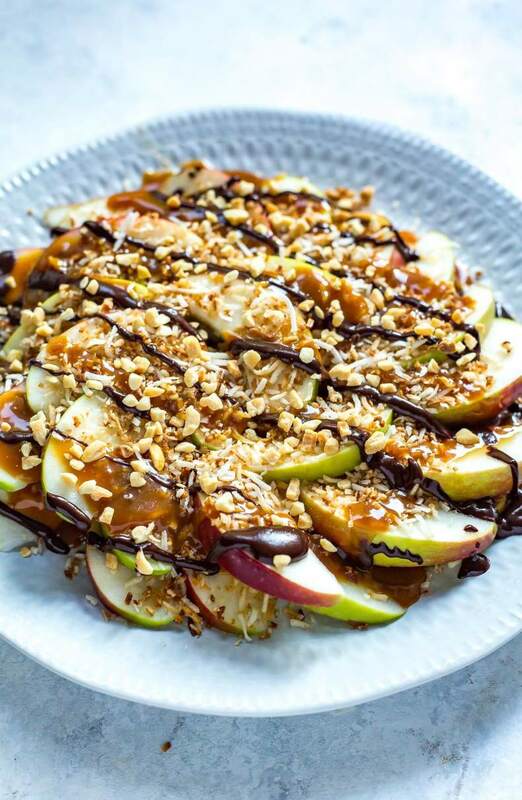 Will you be making these Healthy Samoa Caramel Apple Nachos? In a medium-sized frying pan, heat coconut over med-high heat until just browned and toasted, stirring constantly for 1-2 minutes. Remove from heat right away and transfer to a bowl then set aside. Melt chocolate chips with cream, milk, water or butter in microwave for 1-2 minutes, stirring halfway through. Add to plastic bag. Microwave dulce de leche if using for 30 seconds until just warm and add to another plastic bag. Cut small holes at the bottoms of each bag. Slice and core apples, spreading half on a large plate. 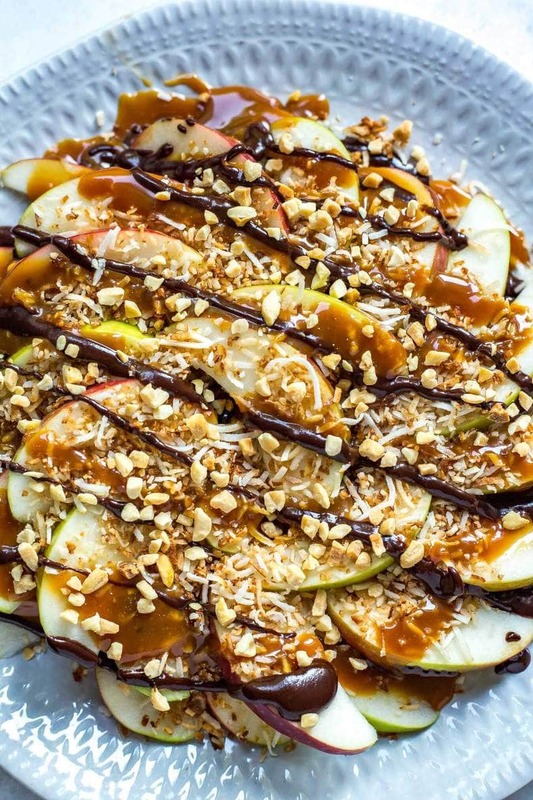 Sprinkle toasted coconut over apples, then drizzle chocolate and dulce de leche overtop. Add peanuts. Add remaining apple slices, then repeat process. Serve and enjoy right away!